Sic Bo is a game of Chinese origin. In Chinese Sic Bo means a pair of dice. The game however is played with three dice. In RTG Sic Bo most of the screen is taken by the betting area because there are a large number of bets on offer. Players like to track the Big and Small bets and therefore the history of these bets is displayed on the right side of the screen. Sic Bo has two types of bets. In the first type the player wagers on the total of the numbers shown in the three dice. The Small bet and the Big bet are examples of this. In the second type of bet the player wagers on the dice combination. For example the Triples bet requires that the same number appears on all three dice. Real Time Gaming Sic Bo provides chips of denominations 1, 5, 25 and 100. The required wager can be made using a combination of these chips by clicking on the chips. This automatically creates the wagered amount in the ‘Amount per bet’ area. By clicking on the area allocated for the specific bets the created amount is automatically wagered. A player can place as many wagers as he wants subject to two conditions. He must have adequate balance in his account for these wagers and he must not exceed the table limit. The amount bet by the player is shown in the Current Bet cell in the top left corner. Clicking on the Roll button results in the dice being rolled across the table. When the dice outcome is revealed, the winning bets are highlighted for the convenience of the player. The amount won by the player is shown just above the chips and the player’s balance is automatically credited. After the roll the chips are automatically removed from the betting area. If the player wants to play with exactly the same wager then he can click on the ‘Repeat’ button. Otherwise he can create the wagers as explained earlier. If after placing the wagers the player wants to withdraw them he can do so by clicking on the ‘Clear’ button. 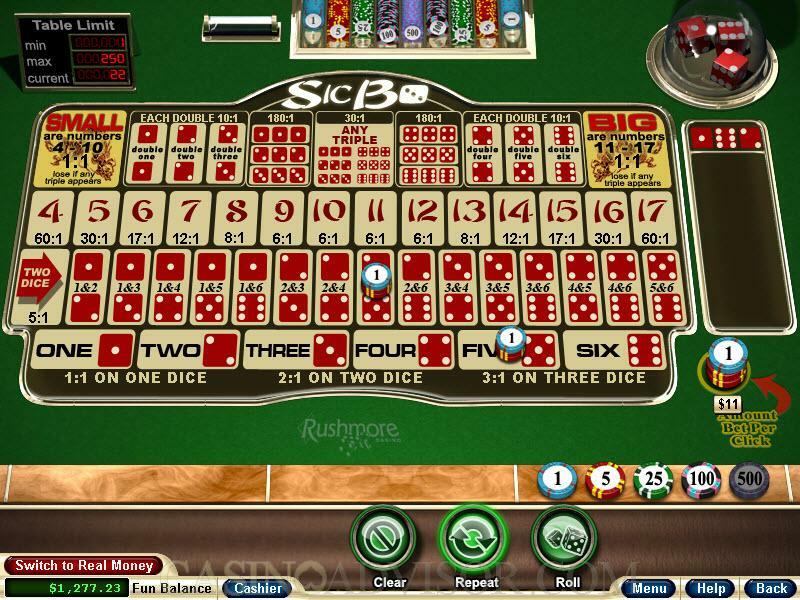 The complete rules and payouts of Real Time Gaming Sic Bo are available in the Help section, which can be accessed by clicking the Help button. 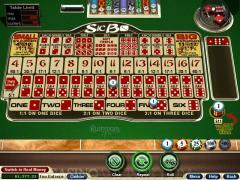 Interested in reading more detailed information about Realtime Gaming Sic Bo? If so Click Here for more details.